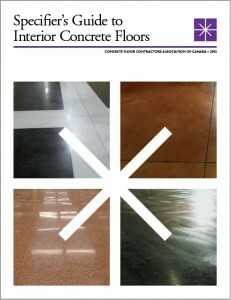 The CFCA is pleased to publish a Specifiers Guide to Interior Concrete Floors for your professional consideration. The CFCA provides complimentary technical assistance to owners and designers of concrete floors to help avoid problems and promote good quality solutions. It is our sincere desire to construct good quality concrete floors that both are durable and sustainable in nature (thank you for your consideration). Please call 905-582-9825 or e-mail if you have any questions, suggestions or concerns. Specifiers are encouraged to register below to receive periodic Concrete Floor technical news updates.